Massive spoilery spoilers for Episode 21 of The Flash, "The Runaway Dinosaur" are ahead. Read on at your own risk. Man, wait…what happened on The Flash tonight, again? Oh, right. BARRY FINALLY GOT HIS SPEED BACK. Well, it’s about time, isn’t it? The Kevin Smith helmed episode got all touchy feely and gave us the moment that we knew was coming, and knew needed to come for Barry and Team Flash to have any chance of defeating Zoom. When Barry gave up his speed to save the Zoom-napped Wally a couple of weeks ago, we all knew that it wouldn’t last, but we also had no idea how the team would manage to make Barry meta again. Harrison Wells had a not-so-brilliant idea in recreating the particle accelerator explosion, this time focused on Barry, to reinstate his speed. As you might remember, that is totally not what happened next. Barry disintegrated right in front of everyone’s eyes and turned into what looked like pure speed force and flew out of the lab, disappearing soon after and leaving a burned Flash suit in its wake. While Barry’s friends were dealing with zombified villain Girder, they also had to find The Flash and get him back on terra firma, whether his speed came with him or not. Cisco touches Barry’s mostly destroyed suit and vibes him in the speed force, meaning that it’s possible to reach him. Meanwhile, Barry is trapped in the speed force, and once he talks with a Joe-like being, realizes that the speed force is actually sorta sentient and talking to him through the people he loves. Speed Force Joe also tells Barry that he can’t return home until he catches the dark blur that streaks past his childhood home. Back at the lab, Harrison gives Cisco Barry’s suit and explains a way to create a feedback loop that should serve as a homing beacon to bring him back to our world. When Cisco reached out to Barry, Speed Force Iris tells him that he can go home now, but it will be without his superpower. Barry decides instead to follow the dark blur and leave Cisco hanging. That blur leads Barry to Speed Force Papa Allen in front of the grave of Barry’s mother, Nora. He reveals that he could never be OK with letting her die after going back in time, and follows the dark blur back to his childhood home, where Speed Force Nora is waiting for him. The speed force tells Barry that he needs to find a way to accept his mom’s death and that the force actually knows that Nora is proud of him. After Barry and Speed Force Nora bond over his favorite children’s book, she asks if he’s ready, and Barry stands, reaches out and grabs the dark blur. It turns out that the blur was him, and the two Barrys join. When Cisco and Iris try again to reach Barry, they succeed. Awww. Barry had to go through an emotional journey to get his speed back from the speed force that gave him his powers in the first place. 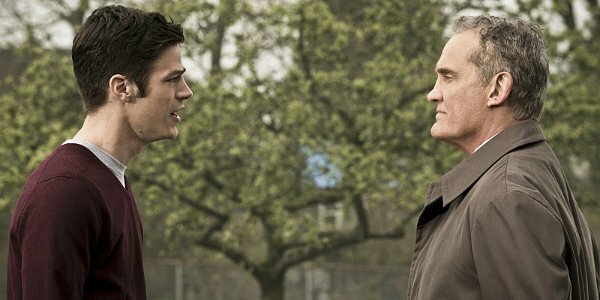 Something tells me that Barry never would have been able to get his speed again without the force kidnapping him and making him face the truth about his mom. Thankfully, everything is right with The Flash world now, and Barry can continue to fight Zoom in the way he was intended to.